Powerful, ancient and strong. These words define the great warriors of the north, the great Vikings. Vikings are thirsty for glory and you are their king, we are talking about no other than the hit game Vikings: War of Clans. 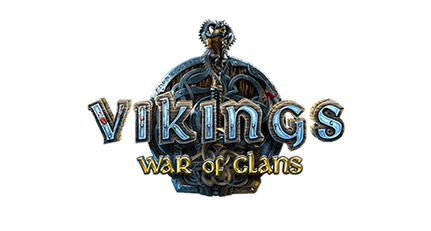 In today’s post we’re going to test websites that offer cheats or hacks for the game to find out if any Vikings: War of Clans cheats actually work. We want to do all the hard work for you and test every hack we find on the internet. We will try them one by one in order to see if it’s actually possible to obtain free gold through the use of hacks. Don’t worry! If at the end of the day we find out they don’t work, we will find an alternative method you can use to obtain free gold. Let us first introduce you to the game itself in case you are a new player. 1 What is Vikings: War of Clans all about? 4 What about cheat codes? 5 How to get gold and resources for the game in a legitimate way. What is Vikings: War of Clans all about? Vikings: War of Clans is a game for Android and iOS released in 2015 by Plarium. The game has good reviews, with an average rating of 4.4 stars on iOS and 4.5 stars on Android. It’s a very popular game with millions of players all around the world. It’s a strategy game where the main goal consist on conquering the “place of power”, a special location in every kingdom. As a Viking you can’t go alone, so you have to either belong to a clan or create your own. In the game your main base is your stronghold. In order to become more powerful you have to increase your stronghold as much as possible. To upgrade your stronghold, you need to gather resources such as lumber, iron, food, stone, silver or gold. As you level up and improve your fort, you can create stronger units, and more advanced technologies. Despite the fact that game is good, it can sometimes be tiresome to have to wait for resources to be collected, battles and upgrades. The in-game currency “gold” is the easiest way to boost and accelerate every aspect of the game. 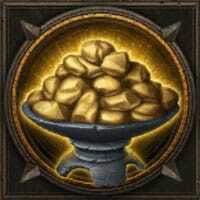 There are two ways of getting gold in the game, one is to earn it by playing the game, winning battles and so forth. The second one is to buy it through in-app purchases. Since buying gold can be quite expensive, there are many people who want to obtain gold for free through the use of cheats. That’s why we assumed the task to look for hacks all over the web, testing all the cheats we could find. We were lucky to find a lot of them, but would they actually work? Let’s find out! 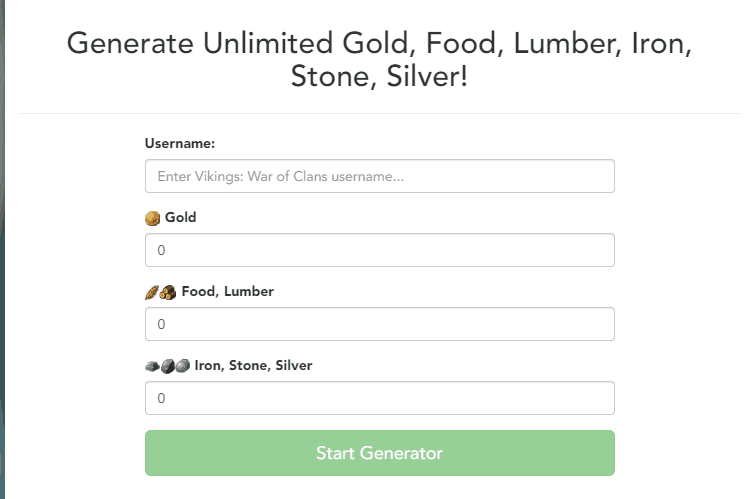 The first (and apparently most popular) hack we found was this so-called “Vikings war of clans hack” which has a very simple interface, you just have to add the amount of gold and other resources you wish to get. This is what your average hack for Vikings: War of Clans looks like. Looks pretty legit right? Unfortunately it’s not! We added our username, the devices we were using (we tried with all of them) and naturally the highest possible amount of gold and resource. Because… Why not? Besides hacks for Vikings: War of Clans there are also sites that offer cheat codes for the game. Usually these websites claim that you can unlock free gold and other resources by entering a specific code into the game. However, while these sites provide you with a code, they do not tell you how to enter this code! The reason for this is simple; you cannot enter cheat codes anywhere in Vikings! These cheat codes are nothing more than a random string of numbers and letters and they do not work at all. Do not waste your time trying to figure out how to enter the codes because you simply can’t. But not all hopes are lost, keep reading to find out how to get free gold by using our own method which we created just for you. How to get gold and resources for the game in a legitimate way. Now that you know there is not any hack available to add gold in Vikings: War of Clans you might be wondering if there is an alternative way to obtain it for free. Well, you are lucky to have us. Here at TapTapGaming we are persistent and never give up. So we discovered a brand-new way to get advantage of the game without messing up with the codes or using useless cheats. We put a lot of time and effort into building a method that can actually give you all the in-game resources without the need of using any cheat or hack. This method is our own, you won’t find it anywhere else. We created a guide that will teach you step by step what you need to do to obtain free resources. You can obtain as many resources as you want with our guide, there’s no limit. So serve yourself and enjoy! Note: our method works on both the Android and iPhone version of the game and you can use it just fine without having to root or jailbreak your device. Click the big blue button below to access our guide and learn how to obtain free gold in Vikings: War of Clans!